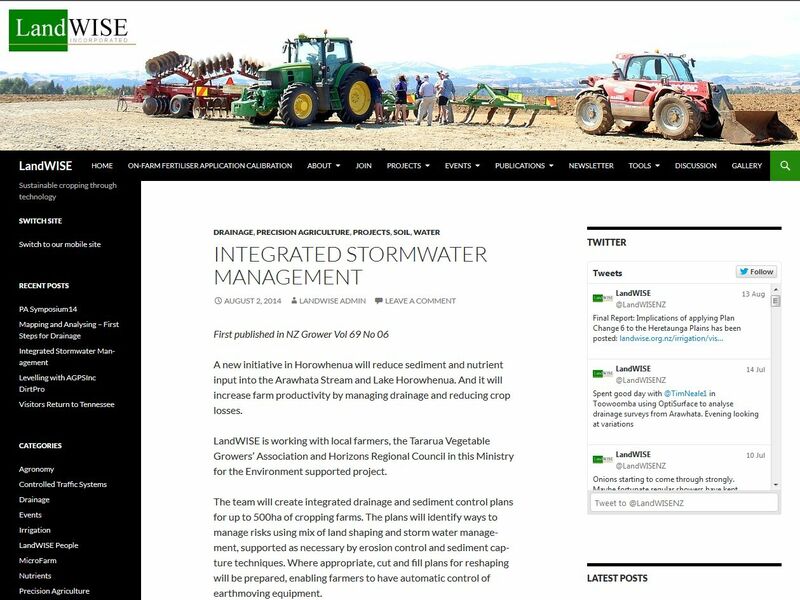 OptiSurface in Press: "Landwise Inc. - Integrated Stormwater Management" – Welcome to the OptiSurface Support Center! A new initiative in Horowhenua will reduce sediment and nutrient input into the Arawhata Stream and Lake Horowhenua. And it will increase farm productivity by managing drainage and reducing crop losses. LandWISE is working with local farmers, the Tararua Vegetable Growers’ Association and Horizons Regional Council in this Ministry for the Environment supported project. The team will create integrated drainage and sediment control plans for up to 500ha of cropping farms. The plans will identify ways to manage risks using mix of land shaping and storm water management, supported as necessary by erosion control and sediment capture techniques. Where appropriate, cut and fill plans for reshaping will be prepared, enabling farmers to have automatic control of earthmoving equipment. The current drainage system, actually the legacy of an historic stock drinking water race scheme, cannot contain run-off from severe storm events. 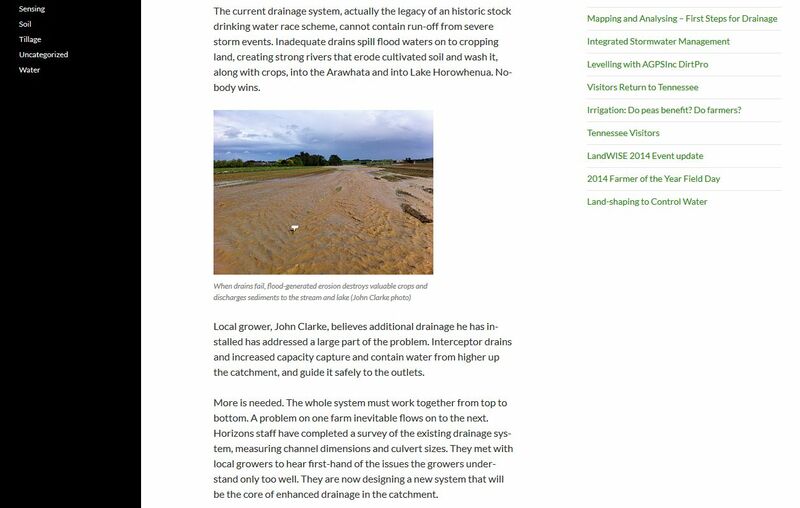 Inadequate drains spill flood waters on to cropping land, creating strong rivers that erode cultivated soil and wash it, along with crops, into the Arawhata and into Lake Horowhenua. Nobody wins. Local grower, John Clarke, believes additional drainage he has installed has addressed a large part of the problem. Interceptor drains and increased capacity capture and contain water from higher up the catchment, and guide it safely to the outlets. More is needed. The whole system must work together from top to bottom. A problem on one farm inevitable flows on to the next. Horizons staff have completed a survey of the existing drainage system, measuring channel dimensions and culvert sizes. They met with local growers to hear first-hand of the issues the growers understand only too well. They are now designing a new system that will be the core of enhanced drainage in the catchment. On-farm, precision surveying with GPS tractors has begun. Using their Trimble technology, the growers can map their properties in 3D, with an error of millimetres. 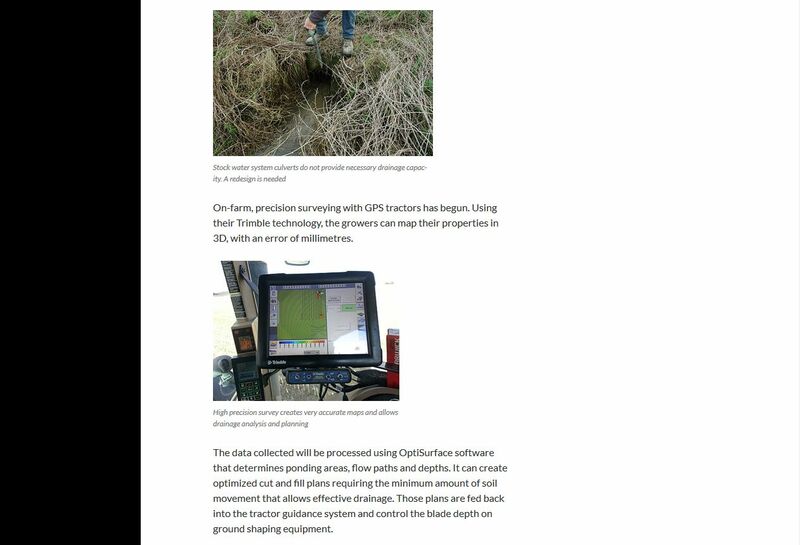 The data collected will be processed using OptiSurface software that determines ponding areas, flow paths and depths. It can create optimized cut and fill plans requiring the minimum amount of soil movement that allows effective drainage. Those plans are fed back into the tractor guidance system and control the blade depth on ground shaping equipment. Expectations are that ponding areas will be identified and removed through strategic levelling. This removes two problems: the bathtubs of ponded, stagnant water that can collect and row ends and destroy crops, and the risk of blow-outs that cause erosion and sediment being lost to the lake. The third level of sediment management is retaining even small amounts of sediment through use of sediment control structures and filter plantings along farm drains. Small but continuous losses add up over time and can constitute a significant loss of nutrients from the farm, as well as more sediment load into the lake. The project will see individual farm plans for each property that can be integrated in New Zealand GAP and used to demonstrate good practice to stakeholders. The project is one of eight that together form the Fresh Start for Fresh Water Lake Horowhenua Freshwater Clean-up Fund programme. Horizons’ Fresh Water and Science Manager, Jon Roygard notes efforts to restore the lake have been ongoing for several decades, including in 1987 stopping the discharge of raw sewage into the lake. Recently, and almost complete, a full native planting buffer strip has been established around the lake. 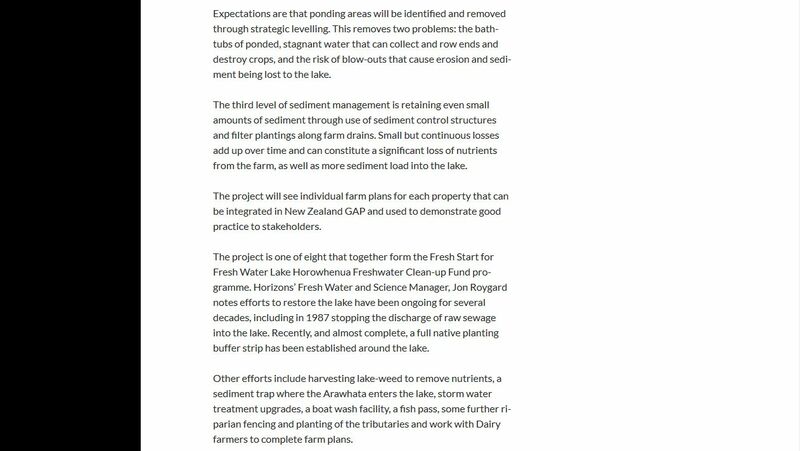 Other efforts include harvesting lake-weed to remove nutrients, a sediment trap where the Arawhata enters the lake, storm water treatment upgrades, a boat wash facility, a fish pass, some further riparian fencing and planting of the tributaries and work with Dairy farmers to complete farm plans.